We like girls who can rap, especially those who are from Chicago and graduated from Stanford. That’s why tomorrow night we’re heading out to Subterranean to re-explore the live show of Chicago-native Katherine Flaherty (aka K.Flay). 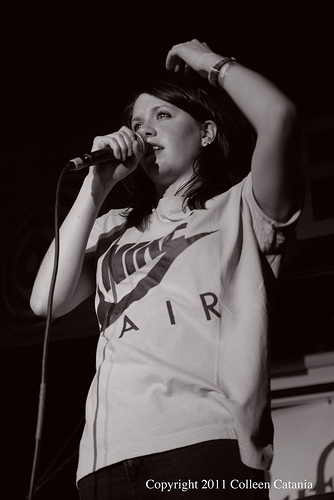 Colleen and I first discovered K. Flay’s cunning blend of hip hop, pop, rock and humorous rhymes back in March at SXSW. Out of the myriad blur of bands we saw at SXSW, her show was one of my favorites, so I had to dive deeper into her creative back story to discover what inspired her to start rapping and making beats. All this said, we’re excited to see how her live performance has evolved over the last 8 months and I’m equally curious to see what’s in store with her new album Eyes Shut that’s due in 2012. And as we continue our exploration into How Women Experience Live Music, we’ll also be chatting with K. Flay before the show about her sociology studying days at Stanford, growing up in Chicago and what she’s learned the most about connecting with a live audience since SXSW. Our interview will be shared in future episode of Live Fix Radio, so if you have a question for K.Flay, post it below and we’ll be sure to ask it during our chat. Check out K.Flay’s latest Official Beastie Boys remix and other clever tunes on her blog.